A tessellation or tiling of the plane is a collection of plane figures that fills the plane with no overlaps and no gaps. A regular tessellation is a mosaic with all pieces being the same size ans shape. A semi regular tessellation is one that has more than on shape filling the plane. In computer-aided design, arbitrary 3D shapes are often too complicated to analyze directly. So they are divided (tessellated) into a mesh of small, easy-to-analyze pieces -- usually either irregular tetrahedrons, or irregular hexahedrons. There a tessellations in nature. 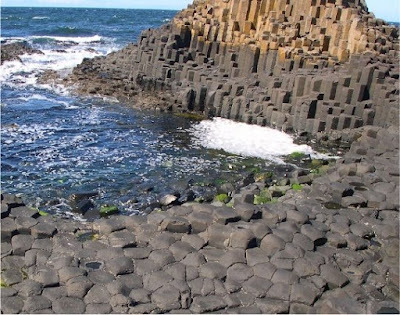 Columnar Jointing and Tessellated Pavement are geological formations made in nature. Tessellations frequently appeared in the art of M. C. Escher.